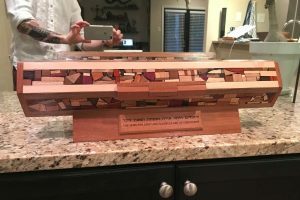 Austin Clar approached me via email to make a megillah case for his family heirloom megillah parchment, the scroll of Esther. He wanted a more honorable place to to keep his scroll while it was not being used. 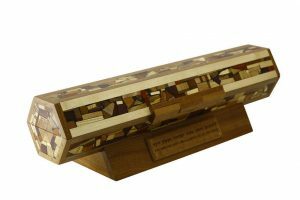 He wanted to create a case in which to house the megillah scroll, worthy of respect to the scroll and the place it holds in his family history. He wanted something to pass down to his children in time. In short, he wanted an heirloom piece. In this way I could process what Austin wanted and hone in on the type of case and the style that he desired. In addition, I sent photos and url’s of previous works, on the web or from my own archives, so that Austin could get a visual of wood colors and styles. Austin wanted a case with many varieties of woods. At Etz-Ron, I use over 30 different types of woods in my multi wood mosaics, and they are hand inlaid into the base wood. In addition to the different types of woods in the mosaics, he also wanted each of the six base panels to be a different wood. He felt this would capture the playful essence of Purim. He wanted a stand, and he wanted the megillah case to be able to detach from the stand. 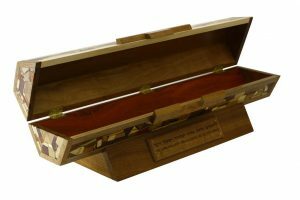 He wanted the megilah case inscribed. Austin and I exchanged no fewer than 10 emails, and finally, I was able to describe to him exactly what he wanted. Then with his permission and commission, I proceeded to make the scroll holder. Seven weeks later, Austin reported that he teared up when he set his heirloom parchment scroll into it’s new case. There, in prominent display on his breakfront, it’s an every day reminder of his unique family history. I felt honored to have a part in making a new home for such a treasured scroll.